The Obama-Biden economic team at press conference. One thing the financial crisis has demonstrated is that the world is very much America-centric, in fact and not just in theory. When the United States runs into trouble, so does the rest of the globe. It follows then that the U.S. response to the problem affects the world as well. Therefore, Obama’s plans are in many ways more important to countries around the world than whatever their own governments might be planning. Obama appears to understand this problem clearly. It would take a very small shift in public opinion polls after the election to put him on the defensive, and any substantial mistakes could sink his approval rating into the low 40s. George W. Bush’s basic political mistake in 2004 was not understanding how thin his margin was. He took his election as vindication of his Iraq policy, without understanding how rapidly his mandate could transform itself in a profound reversal of public opinion. Having very little margin in his public opinion polls, Bush doubled down on his Iraq policy. When that failed to pay off, he ended up with a failed presidency..
His appointments match the evolving realities. 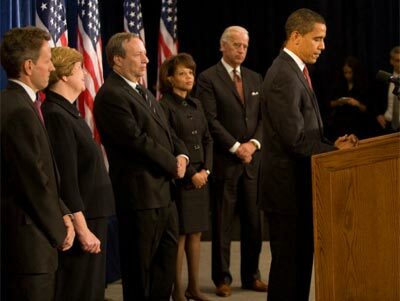 On the financial bailout, Obama has not at all challenged the general strategy of Paulson and Bernanke, and therefore of the Bush administration. Obama’s position on Iraq has fairly well merged with the pending Status of Forces Agreement in Iraq. On Afghanistan, Central Command chief Gen. David Petraeus has suggested negotiations with the Taliban — while, in moves that would not have been made unless they were in accord with Bush administration policies, Afghan President Hamid Karzai has offered to talk with Taliban leader Mullah Omar, and the Saudis reportedly have offered him asylum.. Tensions with Iran have declined, and the Israelis have even said they would not object to negotiations with Tehran. What were radical positions in the opening days of Obama’s campaign have become consensus positions. That means he is not entering the White House in a combat posture, facing a disciplined opposition waiting to bring him down. Rather, his most important positions have become, if not noncontroversial, then certainly not as controversial as they once were. Instead, the most important issue facing Obama is one on which he really had no position during his campaign: how to deal with the economic crisis. His solution, which has begun to emerge over the last two weeks, is a massive stimulus package as an addition — not an alternative — to the financial bailout the Bush administration crafted. This new stimulus package is not intended to deal with the financial crisis but with the recession, and it is a classic Democratic strategy designed to generate economic activity through federal programs. What is not clear is where this leaves Obama’s tax policy. We suspect, some recent suggestions by his aides notwithstanding, that he will have a tax cut for middle- and lower-income individuals while increasing tax rates on higher income brackets in order to try to limit deficits.